I get to be part of One Dress Protest! I just created a black dress from some fabulous hemp and tencel twill fabric from NearSeaNaturals. I created the dress for a wonderful graduate student in Texas who is studying marriage and family therapy. For one whole year, she is going to wear the One Dress every day as a way of becoming ever more intentional about how she experiences and presents herself in the world. I may not be describing her project quite right... But I am impressed with the idea of doing a sort of "fashion fast" in order to take some time to reflect and deliberate about clothing, fashion, style, and dress. Thank you, Lacey, for inviting me to help you to prepare in my small way for your coming year of One Dress Protest! Both my dress creation and my very self are honored to get to be part of your reflection and meditation. 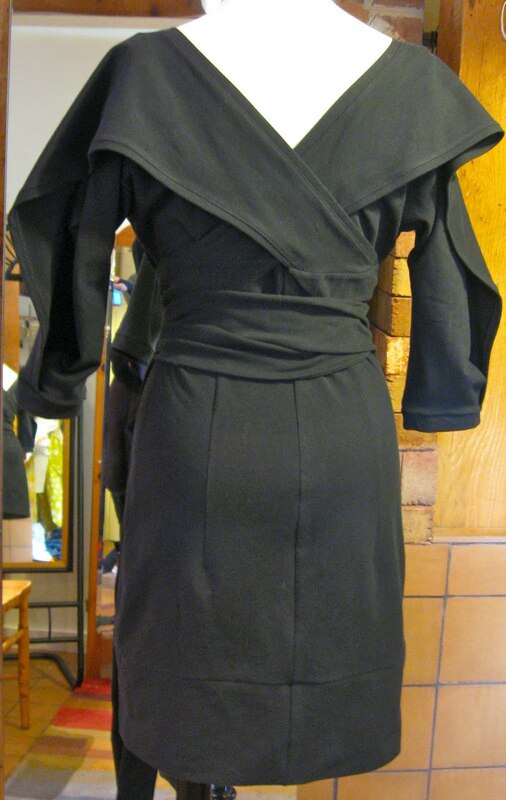 The dress is a shift style frock, very elegant yet utilitarian. The black twill is fashioned into a short sleeve, raglan sleeved style with a wide scooped neckline. At center front and center back, there are small inverted box pleats. The skirt portion of the dress is slightly A-lined and its wide hem ends a couple of inches above the knee. If I were going to wear one dress for a whole year, this dress would be IT for me as well. Beautiful and functional and sophisticated and comfortable, all in one dress. The little skirt grows up to become a fantastic Little Black Dress. To don this baby, you step into the narrow skirt (the fabric is stretchy yet substantial cotton/lycra knit), then draw the fabric up and over your shoulders. To cinch the waist, you wrap the long ties around and around. The black knit works well for the dress, but I can make this design in any light to medium weight fabric. If it were made of a non-stretch fabric, I would simply insert a zipper into the side seam. To achieve this look, I pulled the back of the bodice up and over the shoulders first, then pulled the front bodice up and over the shoulders toward the back. Those shoulder pieces create sleeves because I made them extra wide, wide enough to come down past the elbow. Sure, I DO want to make one of these comfortable and flattering dresses for you! How about royal blue cotton or wool jersey, worn with apricot and gold accessories? Or short and WINTER WHITE, worn over skinny black pleather slacks?